Our fans have been asking for months for us to make a Keto Shopping List for Aldi Grocery Stores, so we flew out to a state that has an Aldi and shopped around to make you guys a video and a list. Keep in mind that some brands or options may be seasonally offered, while some may differ by store or region of the country. This Keto Grocery Shopping Guide is designed to highlight most or at least some of the Keto-friendly food items that you may be able to find at your local Aldi. Aldi is a German-owned discounted grocery chain that has mostly really small stores, and to get through the store you have to practically walk past every item as the aisles snake towards the registers. Think IKEA’s layout but on a Walgreen’s sized scale (or perhaps smaller). The stores are not very large, so it can make getting in and out an easy task. They remind me somewhat of a Fresh and Easy grocery store, except they are still in business. Additionally, not only are they still in business, but they appear to be thriving. There are likely some items at your local Aldi that are still Keto-friendly that I may not have on the list. Feel free to leave a comment at the bottom of the page to let us know some of your favorites in case we missed them, so that we can look into them and add them to the list for others to find at their stores. Wow, you actually had to fly to a state that had an Aldi??!! Yeah, we have NONE in my entire state! I had to see what this ALDI store was all about. Nothing overly exciting on its own, seemed like a generic Trader Joe’s essentially. But I kept getting so many people asking about it and I hadn’t known what to tell them to get at the store. Are the meats grass-fed, seafood wild-caught? Thanks for your many resources and this svc you provide for us wanting to learn! Aldi carries grass-fed ground beef, wild caught salmon and “never any” chicken. You have to check the package but it is clearly marked. These can cost more but they are $1.00 per pound less than other stores. I buy these meats because I am a cancer survivor and don’t want to put a bunch of hormones into my body. Traders Joe is owned by the brother who owns the Aldi chain. In Germany Trader Joe is called Aldi Süd (Aldi South). Both are simular to each other with a little friendly competition. Actually Trader Joes is owned by a brother and the other brother owns Aldi. I have shopped at Aldi for like 40 years and love the store! Yes‼️ Electric Carts are needed ! It’s a necessity for many! I went to the first Aldi ever! Closest one to me is over 200 mile round trip! I will go back. Our Aldi store has a couple electric carts. I live in Waco Texas. I don’t shop there very often because I don’t have the bags to carry my food out and a lot of the fresh meats and vegetables don’t look good. Pecans are the lowest in Carbs and Net Carbs. I buy them and then toast them in the oven with butter and salt then sprinkle with a little erythitol and stevia. 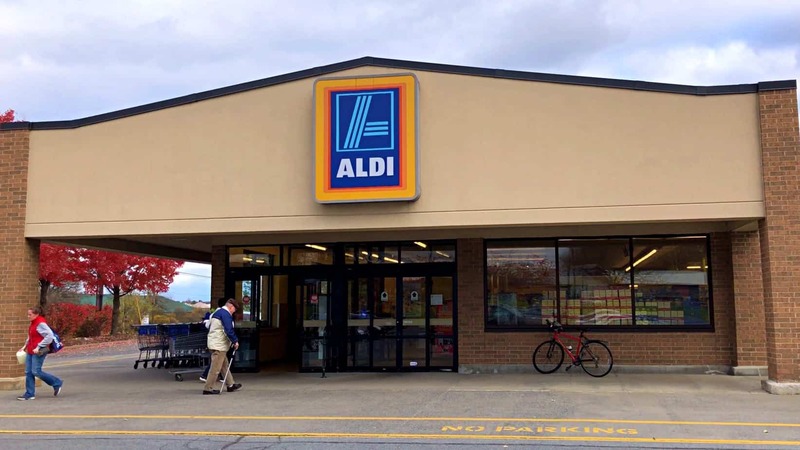 Do you have this Aldi’s shopping list in a printable form? There should be a PRINT icon near the upper left of the post. Be sure to read labels – I was surprised to find their hamburger dill pickles had sugar in them. Yes, always flip the label over to not only look at the Nutrition Facts but also the ingredients list. Is the stivia or truvia packets good to use in place of Monkfruit? Or is that a must for Keto baking? Truvia is not designed for baking, it usually says that on the packaging. That’s why they created a Truvia Baking Blend that has real sugar in it (which defeats the purpose). The Stevia packets will also taste bitter compared to the monkfruit, and also not measure equally. The one Stevia-based sweetener I have used in baking that worked was Pyure brand that I got at Walmart. Other than that the Lakanto Classic Monkfruit Sweetener is the way to go to get a good flavor. I’ve been looking for monk fruit. Where can I find it? I have been buying the Lakanto Monkfruit at Sprouts or directly from Lakant’s website. Please avoid the “Monk Fruit in the Raw” brand that you find at Walmart and elsewhere, since that is NOT the same thing. Aldi is the only place I can find Pork Rinds!!!! They always have them in stock too!!! I love Aldi!!! They always have fresh veggies and at a good price! Electric cards are available inside of store. And yes they carry grass fed beef even buffalo on occasion. On the seafood I think most of them ocean fresh caught. I do most all my shopping there and save a bundle. Buyer beware, some of the frozen veggies are a bit smaller than those from walmart. Thanks for the list. It had some things I wasn’t aware of. Here in Texas they have had problems keeping the pork rinds in stock so I am buying in bulk everytime I go! Best place to shop and we save about $200 a month on our groceries over Publix and Walmart! Im currently on keto diet too so thanks for sharing this! I have a weekly meal plan that all Chinese food then Mexican, etc. Its nice to have different cuisines so I dont have to eat the same thing over and over again.